Candidates for three of the eight major statewide races on this year’s November ballot appear likely to reach Election Day without ever engaging in a debate with their opponent, according to campaign representatives. Candidates for three of the eight major statewide races on this year’s November ballot appear likely to reach Election Day without ever engaging in a debate with their opponent. With less than 30 days until Nov. 4, the Republican and Democratic candidates for attorney general, land commissioner and agriculture commissioner have held no debates and have none scheduled, according to campaign representatives. 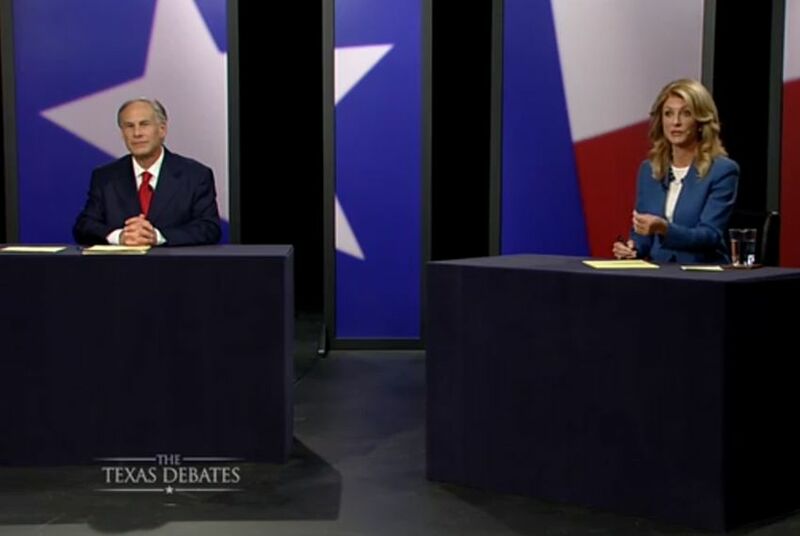 Texans have already seen two televised debates in the gubernatorial race between Republican Greg Abbott and Democrat Wendy Davis and a single debate between Republican Dan Patrick and Democrat Leticia Van de Putte, both running for lieutenant governor. Two more televised debates have been scheduled before Election Day: one on Oct. 24 between U.S. Sen. John Cornyn and his Democratic opponent, David Alameel, hosted by Univision, and another on Oct. 29 between the leading candidates for comptroller, Republican state Sen. Glenn Hegar and Democrat Mike Collier, on Time Warner Cable News in Austin. In addition, the two leading candidates for railroad commissioner, Democrat Steve Brown and Republican Ryan Sitton, are scheduled to take part in a moderated discussion hosted by The Texas Tribune on Oct. 30. The event will be livestreamed online. Of the three nonjudicial statewide races in which no debates are planned, Democrats in two of the races are still pushing for their Republican opponents to agree to one. Trey Newton, a senior adviser with the Bush campaign, dismissed Cook’s criticism, noting that Bush participated in a one-hour on-stage interview at last month’s Texas Tribune Festival and has attended events with voters in 160 counties. In the race to replace Abbott as attorney general, Democrat Sam Houston has repeatedly challenged Republican state Sen. Ken Paxton to agree to a public debate, and accused him of hiding from voters in light of his legal issues surrounding his being disciplined by the Texas State Securities Board for soliciting investment clients without being registered as required by law. The Travis County district attorney's office has said it will hold off on an investigation into Paxton until after the election. Paxton spokesman Anthony Holm suggested that Houston is after free publicity rather than a debate over the issues. "Our opponent is down by 20+ points, unable to raise money and desperate so he's calling for a debate every day; these desperate pleas are the equivalent of a political Hail Mary pass,” Holm wrote in an email. The race for agriculture commissioner is unusual among major statewide races in that neither Republican Sid Miller nor Democrat Jim Hogan has called for a debate. Hogan pointed to the debates that have already taken place this election cycle as proof of their lack of value. “If you saw the debates with Wendy and Abbott, they both talked about how crooked the other one is and they both got it right,” Hogan said. Miller’s campaign did not respond to a request for comment. Even in the races in which debates have taken place or are scheduled, Democrats have criticized Republicans for not engaging in more of them. Van de Putte’s campaign has noted that Patrick, while in a four-way Republican primary earlier this year, participated in two dozen different debates or candidates forums, yet was only willing to do one debate against his general election opponent. Van de Putte had proposed five debates. Patrick said he felt one debate was enough, given that the gubernatorial candidates were holding two. "It's kind of like the way the presidents and vice presidents work," Patrick said in August. Alameel spokesman Gustavo Bujanda noted that Alameel had proposed three debates against Cornyn, including one in a border city focused on immigration. During his last re-election campaign in 2008, Cornyn participated in two debates against Democratic opponent Rick Noriega. In 2012, then-Republican Senate candidate Ted Cruz took part in two debates against Democrat Paul Sadler. Cornyn campaign manager Brendan Steinhauser took issue with the notion that the senator isn’t up for defending his record. “Senator Cornyn has been working tirelessly to get his message out and listen to voters across the state of Texas,” Steinhauser said. “He’s participated in countless grassroots events, community activities, press conferences, media interviews, social media gatherings and other communications with Texans."